Wounded Times: Volunteer Firefighter admitted he embezzled from death benefit fund? Volunteer Firefighter admitted he embezzled from death benefit fund? 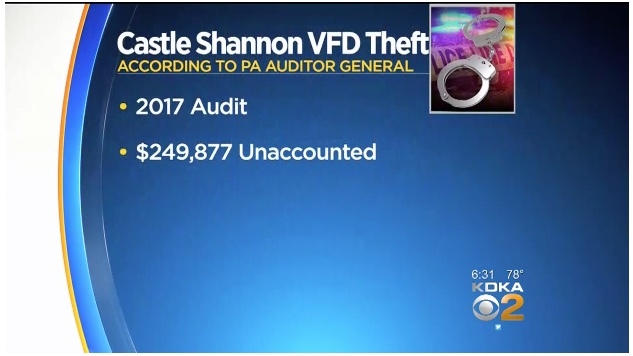 CASTLE SHANNON (KDKA) — A veteran volunteer firefighter in Castle Shannon was charged Thursday with embezzling nearly $140,000 from the department’s death benefit fund, but the state auditor general says even more money is unaccounted for. The Allegheny County District Attorney took over the investigation after the state auditor general uncovered tens of thousands of dollars in unaccounted for money. “What’s sad is that this was a member of the fire department who had worked with his fellow firefighters for over 40 years and had achieved a position of trust,” attorney John Zagari said.